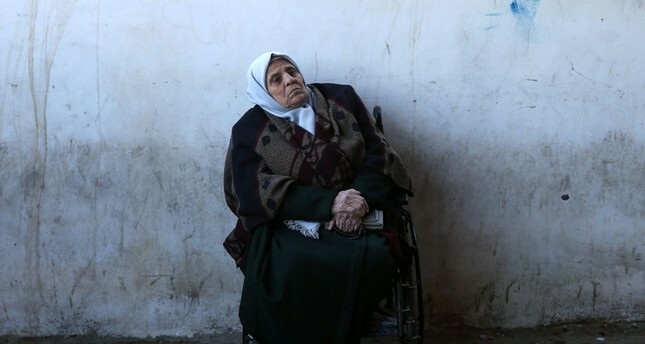 A wheelchair using Palestinian woman waits for a travel permit to leave Gaza through the Rafah border crossing with Egypt, Feb. 3, 2019. Three weeks ago Egypt decided to close the Rafah border crossing. This border is the only one through which residents of Gaza can travel to the outside world. Moreover, it is essential for the entry of materials, nutritional and medical goods. Gazans are living in dire conditions and a large number of people are deprived of basic needs, hence this decision to close the border was a blow. This decision came after the Palestinian Authority (PA) declared that it will no longer continue its presence in Gaza and asked its officials to leave the embargoed areas and surrounding areas. This internal dispute between Hamas and the PA directly affects the residents of Gaza as the PA is responsible for supplying oil and fuel. The PA also pays for the salaries of officials who are tasked with maintaining social services. In the absence of PA officials the infrastructural system and other facilities face collapse. On the other side, Egypt has been pressuring Hamas to stop the clashes at the border with Israel. According to news website Ynet, Egyptian intelligence officials, who met Hamas leader Ismail Haniyeh, said Egypt would keep the border opened permanently but Hamas needed to halt its allegedly violent demonstrations. According to a deal reached last year between Hamas and Israel, several steps were to be taken for the sake of peace and stability. The first phase of the deal went into effect mid-August, enabling the reconstruction of the Gaza Strip under Qatari sponsorship as well as a prisoner swap, a very sensitive issues for Israel. The deal included a would-be comprehensive cease-fire with Israel stopping aerial and border attacks while Hamas would halt sending burning kites or fire missiles, generally made of any material available. Secondly, Gaza's border would be reopened as Gaza residents are trapped on that tiny piece of land. The fishing zones for Gaza's fishermen would be expanded. Israeli forces shoot fishermen in case they go farther than 3 miles. Fishing is one of the main means of livelihood. Medical and humanitarian assistance would be provided. Most importantly for the future, a seaport and an airport may be built in Gaza. The deal sounded exciting as the two parties had never been closer to de-escalation. This deal would be realized along with an understanding between Hamas and the PA. Egypt would be in the middle of these developments. However, besides internal disputes, the rivalries among the concerning countries also made it impossible. For instance, Qatari support for Hamas caused alarm in Egypt where the current administration is supported and funded by the United Arab Emirates and Saudi Arabia. In other words, the appearance of Qatar as a key player in resolving matters in Gaza would give the tiny country an upper-hand in regional politics. Due to the regional and internal disputes Gaza residents are forced to live in terrible conditions. Thousands of people suffer from food shortages and infrastructural problems. The conditions in the hospitals are worrying as much of the medical equipment needed is not allowed in.